Sheik El Mehshi recipe by Nazia Nazar at PakiRecipes.com. 1 tbsp. butter or oil. Peel strips of skin of the aubergine. If preferred, leaving the neck of the aubergines on. Heat some of the butter or oil in a pan and fry the aubergine until browned, then lift out and set aside. Heat the butter in the same pan, add the onions and fry them until brown. Add the minced meat, season with the cumin, all spice, salt and pepper and then add the pine nuts. Slice open the aubergines and fill them with the meat and onion mixture. Place them in an ovenproof pot or dish. Heat water in a separate pot and add the tomato paste. Let it boil and carefully pout it over the stuffed aubergines. Season with salt and both peppers. 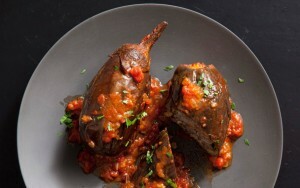 Top each aubergine with a slice of tomato , then place in a preheated oven until for 25 mins. or cook on a low heat until aubergine is just tender but not soft.